Forests play a prominent role in many folktales and legends. In these dark, mysterious places, heroes can lose their way, face unexpected challenges, and stumble on hidden secrets. Part of the age-old magic of forests lies in the ideas that people have had about trees. In myths and legends from around the world, trees appear as ladders between worlds, as sources of life and wisdom, and as the physical forms of supernatural beings. With its roots buried deep in the earth, its trunk above ground, and its branches stretching toward the sky, a tree serves as a symbolic, living link between this world and those of supernatural beings. In many myths, a tree is a vital part of the structure of the universe. Gods and their messengers travel from world to world by climbing up or down the tree. 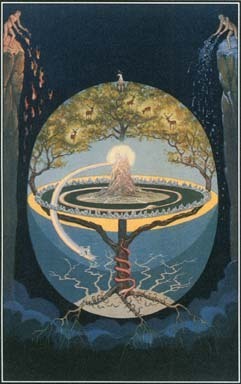 The Norse* believed that a tree runs like an axis, or pole, through this world and the realms above and below it. They called their World Tree Yggdrasill. It was a great ash tree that nourished gods, humans, and animals, connecting all living things and all phases of existence. In traditional societies of Latvia, Lithuania, and northern Germany, the world tree was thought to be a distant oak, birch, or apple tree with iron roots, copper branches, and silver leaves. The spirits of the dead lived in this tree. Greek folktales tell of goblins in the underworld who try to cut the roots of the tree that is holding up the earth and the sky. Norse legends contain a similar image with an evil serpent forever gnawing at Yggdrasill's roots. The mythology of early India, preserved in texts called the Upanishads, includes a cosmic tree called Asvattha. It is the living universe, an aspect of Brahman, the world spirit. This cosmic tree reverses the usual order. Its roots are in the sky, and its branches grow downward to cover the earth. Providers of shade and bearers of fruit, trees have long been associated with life and fertility. Evergreen trees, which remain green all year, became symbols of undying life. Deciduous trees, which lose their leaves in the winter and produce new ones in the spring, symbolized renewal, rebirth after death, or immortality. In Norse mythology, the World Tree called Yggdrasill runs like a pole through this world and the realms above and below it. Yggdrasill is a great ash tree that connects all living things and all phases of existence. Many creation myths draw on trees as symbols of life. In some versions of the Persian* creation story a huge tree grew from the rotting corpse of the first human. The trunk separated into a man and a woman, Mashya and Mashyane, and the fruit of the tree became the various races of humankind. Norse* mythology says that the first man and woman were an ash and an elm tree given life by the gods. The same theme appears in myths of the Algonquian-speaking people of North America, which tell that the creator and culture hero Gluskap fashioned man from an ash tree. The tree of life, with sacred animals feeding on fruit-bearing branches, is a common image in the art of the ancient Near East. The tree was associated with palaces and kingship because the king was seen as the link between the earthly and divine realms. Through him, the gods blessed the earth with fertility. Traditional Persian and Slavic myths both told of a tree of life that bore the seeds of all the world's plants. 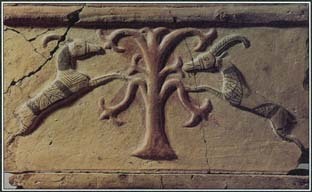 This tree, which looked like an ordinary tree, was guarded by an invisible dragon that the Persians called Simarghu and the Slavs called Simorg. For fear of cutting down the tree of life by accident, Slavic peoples performed sacred ceremonies before taking down a tree. The Persians cut no trees but waited for them to fall naturally. In the mythology of the Yoruba people of West Africa, a palm tree planted by the god Obatala was the first piece of vegetation on earth. Trees—or the fruit they bore—also came to be associated with wisdom, knowledge, or hidden secrets. This meaning may have come from the symbolic connection between trees and worlds above and below human experience. The tree is a symbol of wisdom in stories about the life of Buddha, who was said to have gained spiritual enlightenment while sitting under a bodhi tree, a type of fig. Two sacred trees—the Tree of Life and the Tree of Knowledge of Good and Evil—appear in the Near Eastern story of the Garden of Eden, told in the book of Genesis of the Bible. God ordered Adam and Eve, the first man and woman, not to eat the fruit of either tree. Disobeying, they ate fruit from the Tree of Knowledge and became aware of guilt, shame, and sin. God cast them out of the garden before they could eat the fruit of the Tree of Life, which would have made them immortal. Thereafter, they and their descendants had to live in a world that included sin and death. A traditional Micronesian myth from the Gilbert Islands in the Pacific Ocean is similar to the biblical account of the fall from Eden. In the beginning of the world was a garden where two trees grew, guarded by an original being called Na Kaa. Men lived under one tree and gathered its fruit, while women lived apart from the men under the other tree. One day when Na Kaa was away on a trip, the men and women mingled together under one of the trees. Upon his return, Na Kaa told them that they had chosen the Tree of Death, not the Tree of Life, and from that time all people would be mortal. After European missionaries introduced Christianity to the Native Americans, the Yaqui of the American Southwest created a myth about a talking tree that spread the news of the new faith. One day the people came upon a tree whose vibrations made a sound that no one could understand. A wise woman who lived deep in the forest sent her daughter to interpret the sounds. The talking tree told of the Christian God and the priests who would soon arrive to teach the people new beliefs and new ways. Not everyone welcomed the coming changes. Some people left to dwell under the ground, taking the old ways with them. Those who remained became the Yaqui. The tree of life, with sacred animals feeding on its fruit-bearing branches, is a common image in the mythology and art of the ancient Near East. Another belief about trees sees them as embodying deities, spirits, or simply humans changed into trees by a special fate. Some Celtic* and other European peoples worshiped groves of trees as well as particular trees. In the religion of the Druids*, oaks were sacred. The ancient Romans associated oak trees with their sky god, Jupiter. In Greek and Roman mythology, Dryads (also called Hamadryads) were nymphs who lived in trees and perished when their trees died or were cut down. A similar myth from Japan tells of a man who cherished a willow tree. One day he met a girl under the tree and married her, although her past was a mystery. When the emperor ordered the willow tree cut down to build a temple, the man's wife told him that she was the spirit of the tree, and she died as the tree fell to the ground. Some myths tell of supernatural beings or humans who were changed into trees. In Greek mythology, the nymph Daphne turned into a laurel tree when fleeing through the forest to escape the advances of Apollo*. Lotis, another nymph who fled from unwanted advances, became the lotus tree. Other transformations symbolized eternal love. In a Greek myth, the gods turned Baucis and Philemon, a devoted old couple, into an oak and a linden tree when they died. The trees grew close together. In Japan, two pine trees growing close together were said to be faithful lovers. Tales from many cultures speak of the dead being reincarnated, or reborn, as trees, and legends and songs often tell of two trees, their branches linked or intertwined, that grow from the graves of lovers. A Japanese myth tells of a poor elderly couple whose only joys in life were their pet dog and the beautiful blossoms of the cherry tree. After the dog found buried gold for its owners, a jealous neighbor killed the beloved animal. The old man and woman buried the dog under a cherry tree and believed that the dog's spirit inhabited the tree. With wood from one of its branches, they made a mortar—a bowl for grinding grain—that magically produced plenty of flour, even in a time of famine. The same wicked neighbor burned the mortar, but the old man found that its ashes, when sprinkled on the dog's grave, caused the cherry tree to produce its lovely blossoms at any time of year. See also Adam and Eve ; Druids ; Eden, Garden of ; Flowers in Mythology ; Fruit in Mythology ; Plants in Mythology ; Yggdrasill .